Congratulations to Tim “Bounty” for April 2014 JOTM Winner! This picture was taken in Bridgeport at the Screamin’ Lizard winter shakedown run. This particular area is what’s left of the access road that used to be the easiest way to go around the twins. Unfortunately I was not able to make it to the top, and I did have to get winched, my steering box skid was hung up on a ledge. The Jeep was in a precarious spot at this time, very tippy, we used a winch line on the rock slider from the side, and one line to the top. The Jeep pulling me to the side suffered a broken driveshaft while trying to drag my Jeep sideways. Thanks to Ty (tmorton) for taking the picture, Rob (RAWRR) for the anchor point at the top, Brian (mmmmbeer) for the sideways winch, anyone else who helped with the recovery, and thanks to everyone that voted for me. 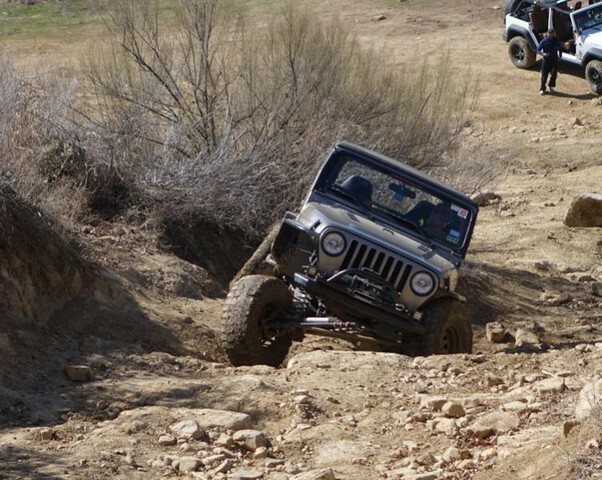 The Jeep is a 2005 Rubicon on 33″ MTR’s, lots of armor including Genright flares, Teraflex belly up skid, and most recently an Under Cover Fabworks aluminum front bumper. ← March 2014 JOTM Winner!